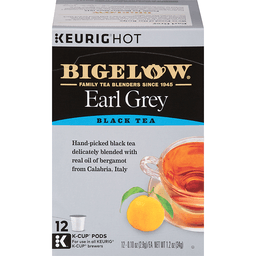 Bigelow® Earl Grey Black Tea K-Cup® Pods - 12. Keurig® hot. Family tea blenders since 1945. Hand-picked black tea delicately blended with real oil of bergamot from Calabria, Italy. For use in all Keurig® K-Cup® brewers. 12-0.10 oz (2.9g)/EA. Caff-o-meter† content per serving. Coffee 100-120mg. American breakfast 60-90mg. Black tea 30-60mg. Green tea 25-50mg. Decaf tea 1-8mg. Herbal tea 0mg. †Represents average caffeine content; individual products may vary. Our promise. We're fully committed to your satisfaction and we love to hear from you! When you do call, please share the code number on this box with the consumer service crew. Try all varieties. 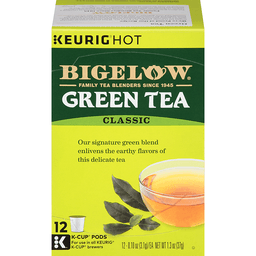 Keurig Hot, Bigelow, Green Tea, Classic. Keurig Hot, Bigelow, Lemon Ginger, Herbal Tea. Keurig Hot, Bigelow, English Breakfast, Black Tea. Keurig Hot, Bigelow, Vanilla, Chai. We're proud of our recipe. For our special earl grey, we're adamant about using only the best bergamot oil. We source ours from the same garden in Calabria, Italy year after year. Then we carefully blend this flavorful and aromatic bergamot with a bold hand-picked black tea... a recipe like no other. Family tea blenders since 1945. For three generations, the Bigelow family has specialized in creating a variety of deliciously different teas. Using only the finest ingredients and secret family recipes ensures that each cup of Bigelow tea is backed by over 70 years of family passion. Printed in the U.S.A. Bigelow tea facts. We produce 1.7 billion tea bags a year. For more fun facts follow us: bigelowtea.com. This package is made with a minimum of 35% post-consumer materials. For more information about Bigelow tea, please contact us: 1-888-BIGELOW (1-888-244-3569). bigelowtea.com. For brewer inquiries: 1-866-901-BREW/1-866-901-2739. www.keurig.com. 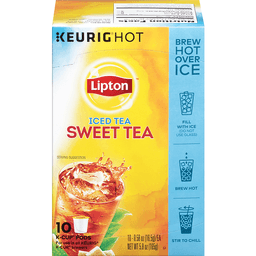 ©2015 Keurig Green Mountain, Inc.Attn: Consumer Services Group. ©2015 Bigelow Tea. Keurig, K-Cup, and the K logo are trademarks of Keurig Green Mountain, Inc., used with permission. Ethical tea partnership.